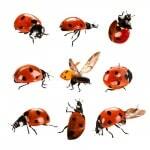 The Ladybird – also known as ‘lady bug’ and ‘lady beetle’ – are technically beetles from the family Coccinellidae. There are around 6000 species of Ladybird worldwide but a recent survey has found there around 26 recognisable species in the UK. Colourways vary between yellow, orange and red with black spots on their wings. Generally ladybirds are considered useful as they feed on aphids and other garden pests, however some subspecies are plant eaters and can destroy crops. Their Latin name ‘coccinellidae’ is derived from ‘coccineus’ which means ‘scarlet’. They are considered lucky in many cultures and have many poems and stories written about them – and indeed a whole book company named after them. For example in Turkey they are called the ‘good luck bug’, and if you see one you should make a wish. Ladybirds seldom bite people but they can secrete a yellow fluid – this is a natural defence designed to stop birds from eating them. This fluid is pungent and caustic with a very bad taste – birds will be put off trying ladybirds twice! Ladybirds hibernate in the winter, different species in different places but common spots are in trees, under tree bark etc. They will gather in large groups when looking for a suitable place to hibernate and can become a nuisance due to their sheer numbers.